Ah, NAB Cart Machines – some people love them, others find them annoying, prone to wow/flutter and never have enough storage space for a cart-rack. With this free application, none of that is a problem! You have a file+folder view on the left of the window showing available drives, folders and audio files – whilst the default view offers a set of 3 “cart” machines modelled on the famous Sonifex microHS series. You can also change them to 3 ITC Series 99 machines or an ITC triple-stack. They work just like the real-thing – Drop a file into the “slot”, press play – the timer counts down with the audio. After play, the Stop button will flash to indicate that the cart has finished. You can pause the cart by pressing stop, but remember to re-cue it before re-starting it 😉 Double-clicking a cart will eject it. You can also Start the slots by pressing F1, F2, F3. Files can also be dropped from any “Explorer” window. The “cart labels” are populated using the ARTIST – TITLE syntax from the filename. Includes joystick remote-start via analogue 15-way port or USB interface. Buttons 1-3 start the players. 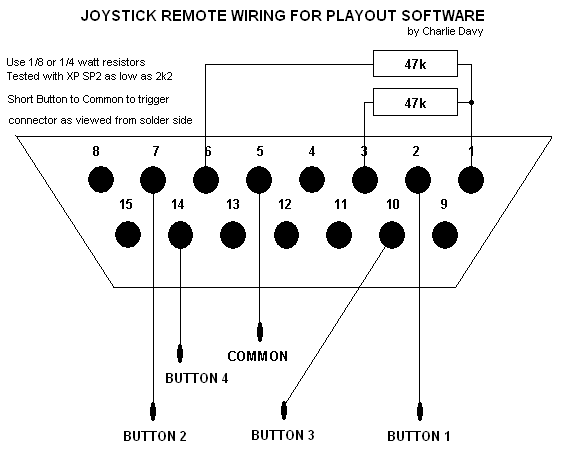 See this image for a wiring example. Download the full ZIP file here (it contains some sample audio and a couple of DLL/OCX files) – just unzip the contents into any folder and run. This is a FREE application and offered “as-is” with no support whatsoever.